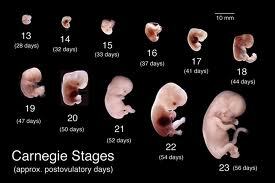 Stage stage of human development has a long phase. For the purpose of organizing and understanding, we generally describe the development in terms of periods or phases of development. Classification of developmental period most widely used include the following sequence: prenatal period, infancy, early childhood kids, during the mid and late children, adolescence, early adulthood, middle age and the end of the mature adult. Estimated average age range in the following period to give a general idea of ​​when the period begins and ends. Here is a more detailed explanation at each stage of human development stage period in the book Life-Span Development by John Santrock: Period antenatal (prenatal period) is the time from conception to birth. This period is a time of incredible growth from a single cell organism to be perfect with the ability of the brain and behavior, resulting in a period of approximately 9 months. Infancy (infacy) is the developmental period that spans from birth to 18 or 24 months. Infancy is a period that is very dependent on adults. Many psychological activity that occurs only as the beginning of such a language, symbolic thought, sensorimotor coordination, and social learning. Early childhood children (early chidhood) developments spanning the period from infancy to age five or six years, this period is usually called the preschool period. During this period, young children learn more independently and take care of themselves, develop school readiness skills (following orders, identifying letters), and spent countless hours of time to play with your peers. If you have entered the first grade of primary school, then in general the end of its initial children. During the mid and late children (middle and late childhood) is the developmental period extending from about age six to eleven years old, approximately equivalent to a year in elementary school, this period is usually referred to the year in primary school. Skills fundamental skills such as reading, writing, and arithmetic has mastered. Children formally linked with the wider world and culture. Achievement become a more central theme of the child's world and self-control increased. Adolescence (Adolescence) is a period of transition from early childhood to early adulthood children, who entered at the age of approximately 10 to 12 years old and ending at age 18 years to 22 years. Adolescence begins in rapid physical change, weight and height were dramatic, changes in body shape, and the development of sexual characteristics such as breast enlargement, development waist and a mustache, and it sound. In this development, the achievement of independence and identity are prominent (the logical thinking, abstract and idealistic) and the more time spent outside the family. Early adulthood (early Adulthood) is a period of development that begins in the late teens or early twenties and ended at the age of tugapuluhan years. It is the formation of personal and economic independence, future career development, and for many people, the mate selection, learning to live with someone familiar, start families, and parenting children. The mid-adulthood (middle Adulthood) is a period of development that begins at the age of approximately 35 to 45 years and spans up to age sixties. It is time to expand the involvement and personal and social responsibility as individuals to help the next generation become competent, mature and achieve and maintain career satisfaction. The period of late adulthood (late Adulthood) is a period of development that begins at the age of sixties or seventies and ended in death. It is a time of adjustment to the loss of strength and health, looking back over his life, retirement, and tuning in to the role of new social roles.